Say hello to Bud, our oldest known customer. Not wanting to deal with wood fences anymore due to the painting and staining hassles, he decided to go for maintenance-free vinyl. 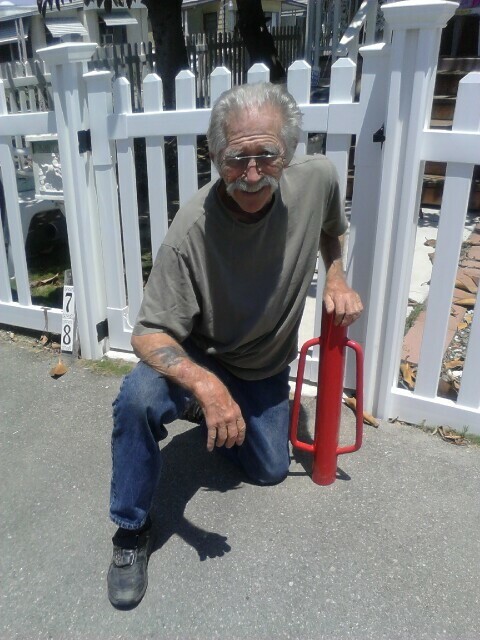 Thus, at the age of 81 he single-handedly installed his Jiminy Picket Vinyl Fence. Although he has an email address (with “1935” appended to it), Bud’s not one for email so all communication between us and him was done via phone or snail mail. He had a great experience and wanted to share a review, so he wrote a letter and utilized technology by having someone fax it to us. Check out his letter here. “When I was a child, I can still remember my mother and her friends talking about the green shuttered house & white picket fence. Now, all these years later my wife wants the white picket fence. Wanting nothing more than to please Sue (my wife) I start looking (o yah). All of this lead to my quest for something else. 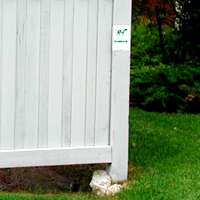 After bumbling thru the internet checking Lowe’s, Home Depot, local fence companys for what seams like forever I somehow stumble across this funny name Wam Bam Fence Co (what the h***) give it a go…” Read more. Bud was a pleasure to work with, and we are very impressed at his energy, drive and handy man skills! What About No-Dig Fence and Frost Heave? Many moons ago, Clever Joe was a frustrated fence installer in Western Canada. The frost conditions are so bad up there that no matter how deep he dug his cement footings, they would still occasionally heave out of the ground. When a cement fence footing heaves out of the ground, it is virtually impossible to fix and can make the entire fence look bad. Cement footings create a “lip” that makes it much easier for frost to heave. A pipe anchor doesn’t have as much surface area so the frost has a much more difficult time heaving it. If for some reason an occasional no-dig fence post did heave out of the ground, it was relatively easy to fix. One could easily dismantle the post and reset the leveling donut or even the pipe if necessary. It’s virtually impossible to fix a heaved cement footing but it’s very feasible to fix a heaved pipe anchor. In short, no-dig fence works extremely well in areas with bad frost. WamBam’s no-dig fencing has been installed in some very cold climates with very few issues- from North Dakota to Winnipeg, Canada. While we can’t promise that a pipe will never heave, we can assure you that it will be fixable, which is not the case with a cement footing. If you would like to discuss this in greater length with one of our fence specialists, feel free to call us at 877-778-5733.